The Molecular Engineering & Sciences Building was carefully designed and engineered to facilitate advanced molecular-level engineering research.Located on the former site of Cunningham Hall within the engineering and science core of the UW campus, the building is ideally situated to catalyze the cross-departmental research and educational collaborations that are necessary for building an interdisciplinary research program in this field. It features an open layout designed for shared research space and a dedicated molecular and nanotechnology instrumentation lab. The building was specially sited to minimize vibration and electromagnetic interference to permit usage of sensitive instrumentation. The design maximizes the ground contact lab space to fully exploit this location, which will eventually allow consolidation of molecular research instrumentation across campus into a shared user facility (see Molecular Analysis Facility). The upper floors are designed to enable easy reconfiguration to accommodate the evolving research landscape and the open layout promotes interaction and collaboration. Groundbreaking for the 90,300 square-foot state-of-the-art facility took place on October 9, 2009. The building was completed during the summer of 2012 and a research symposium and opening celebration was held on Sept ember 18, 2013. 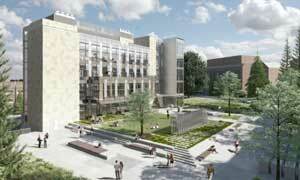 For additional photos of the building during construction, see the Molecular Engineering & Sciences Building site. The Molecular Engineering & Sciences Building is LEED gold certified and features a natural ventilation system in its offices.